The sequel to Platformance: Castle Pain from Indie dev team Magiko Gaming has been released on the Xbox Indies marketplace for 80 MSP ($1). Platformance 2: Temple Death is a Pitfall-styled side-scrolling platformer where players must use their jumping and reflex skills to cross many obstacles and other hazards and dangers. Platformance: Temple Death keeps the features that made the first game memorable like the ability to zoom in on the action or zoom out to see the entire level, original and puzzling trap designs, and cute pixel art graphics. This release comes straight with scoreboards (local and online) for speedrun freaks as well as a rewards/flopwards system. 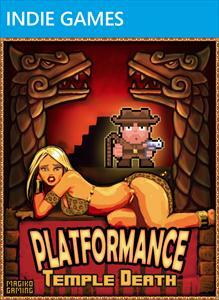 Platformance: Temple Death has also been submitted as an entry to the 2011 Dream.Build.Play Competition. For more information on Platformance: Temple Death and the Independent XNA team that developed it, Magiko Gaming, please visit their official website. Battle High 2: New Students Coming Soon to XBLIG ? Brimstone Xbox Indie Review ? Indie Game Uprising III Kicks Off on September 10th ?